He didn’t quite make it to the top bracket on ABC’s The Bachelorette, but Chris Bukowski (also a star of the Bachelor Pad) now has his own tasty tournament spot for single elimination. 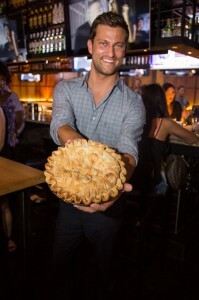 To make the resto launch — and also his birthday — a gamechanger, Bukowski feted his big day at the Bracket Room with a fundraiser for the American Foundation of Suicide Prevention, raising over $1000 in remembrance of good friend and fellow Bachelor contestant Gia Allemand. The kind remembrance was accompanied by a sweet surprise. Bukowski and hosts offered attendees, along with champagne and sparklers, miniature apple pies from Pie Sisters (and the birthday boy finally got a piece a pie, too, seen at left). Birthday bribery is the best way to Bracket!